The facade simultaneously invites entry but affords privacy, shielding both the house beyond as well as the sweeping views from the cliff down to the sea, views privileged to the owner. Note, too, how Neutra slows your journey to the front door, a strategy he witnessed in Japan. The flawlessly sited 4,124-square-foot 1958 Connell House by Richard Neutra may be demolished in favor of a 11,933 (12,000) -square-foot house, downsized from a total 16,385 square feet proposed in December. The Neutra occupies the east end of what is a transcendent 2.13 acre site — to the west is the rugged Pacific coastline, while the iconic Cypress Point Golf Course wraps the south and east views … it doesn’t get closer to heaven than this. Below is a letter I’ve written to the Planning Commission, Monterey County, and urge you to consider writing one, too. The photos are by Dr. Anthony Kirk; below my letter is the link to the December agenda item listing the many permissions the new mansion would require. The proposal recalls the demolition of the expansive, Frank Sinatra-chic 1962 Maslon House, with an important exception. The Maslon was also flawlessly sited (and thus doomed), the broad site jutting into a commanding view of an exclusive golf course in Rancho Mirage on two sides. It was razed for its trouble in 2002 in a ministerial (not requiring review, though it should have been evaluated for significance) and surprise move virtually overnight. I walked the chaotic ruin the next morning, and took a small section of the chimney, two bricks worth, home. The Connell House, in contrast to the lost Maslon House, does require review. That is the important exception, and our window of opportunity. 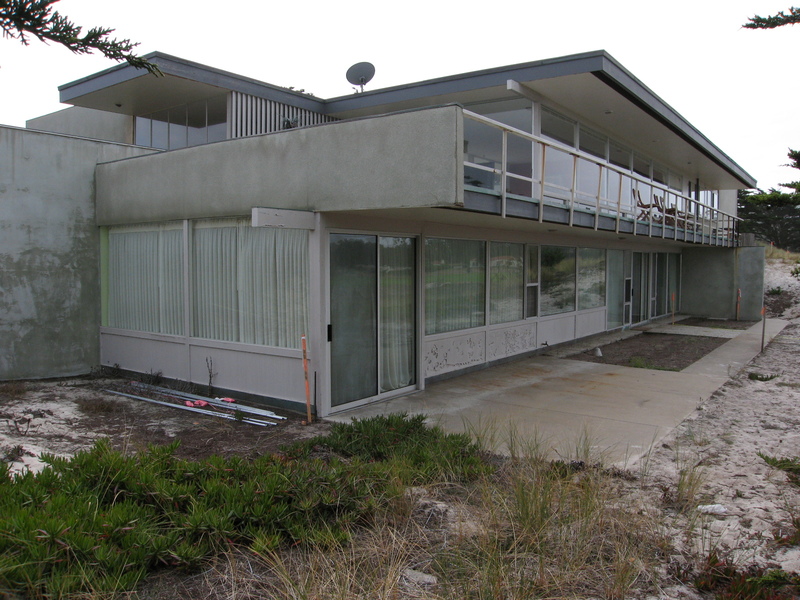 I am writing to on behalf of the Connell House, designed by Richard J. Neutra (1892 – 1970) and completed in 1958. Allow me to introduce myself. As the author of Richard Neutra – Complete Works, and Neutra – Selected Projects (Taschen, 2000, 2004), I am a scholar of Neutra’s works, numbering some 450 projects worldwide, and am completing a Ph.D. on his work at the University of Liverpool. Professionally, I am a qualified architectural historian according to the Secretary of the Interior Standards 36 CFR Part 61. Trained as an architect with an M.Arch. degree, both privately and as Senior Architectural Historian, ICF International, Los Angeles, I evaluate buildings for historic significance for lead agencies and developers; assist architects with interpreting the Standards; prepare National Register and Landmark nominations, among other duties typical of my profession. I am writing you in my capacity as an expert on Neutra’s works, though I apply professional standards, objectivity, and expertise in considering his projects. Given his prolific contribution to 20th century architecture, while undoubtedly a master architect, it is nonetheless unwise to assume anything a master architect designed is worthy of National Register consideration, as the Register guidelines for criteria remind us. Before I received word of potential demolition of the Connell House from Dr. Anthony Kirk, I had only a superficial acquaintance with the dwelling, primarily for writing the Complete Works. 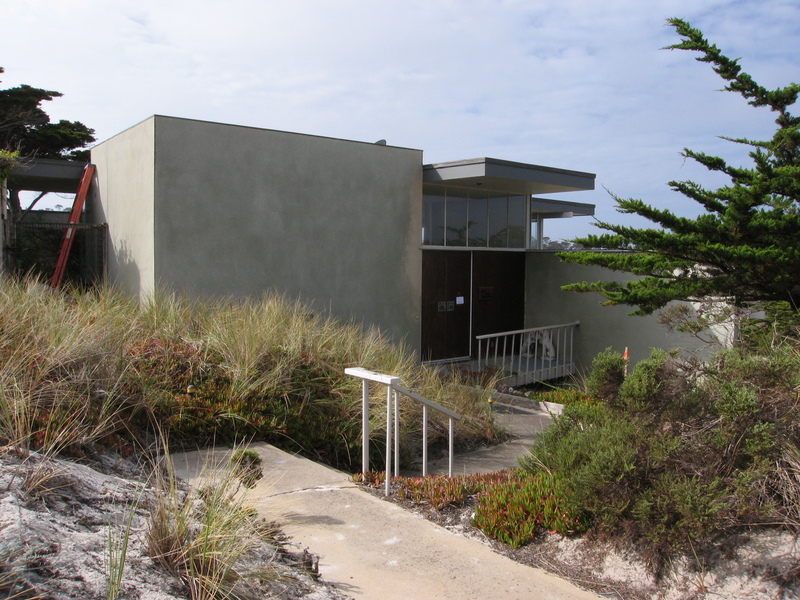 But the more I considered the house, the more I am convinced that Monterey County can be proud of having a highly accomplished example of Neutra’s work in its midst, an aesthetically compelling, spatially complex house perfectly wedded to its site. Apart from Neutra’s well-known books such as Survival Through Design and Nature Near, both championing the requisite of nature in an architecture tailored to essential human needs, he also wrote a book directed at laypeople titled Mystery and Realities of the Site. Through this poetic little volume dense with images, he taught how building and landscape could be integrated to create an indelible experience on behalf of the environment as well as the occupant, delivering a compressed building footprint that nonetheless conferred a sense of expansiveness and tranquility for its inhabitants. The Art Connell House acquits Neutra’s convictions in both arenas addressed by these books. Ironically, his acute attention to site (he was renowned for helping clients to choose sites, even walking the site with his clients to evaluate it for both day as well as night conditions) now threatens these houses: because the site is so exquisite and often generous in size, the house itself becomes an impediment to development, typically a much larger dwelling. The two-level Art Connell House exemplifies Neutra’s signature trademarks in its careful asymmetric composition of volumes and opposing opaque (stucco) and transparent (glass) planes. Roof planes of disparate sizes, adding visual interest, extend over those areas where protection from the sun is important. In its resolution of volumetric complexity, the house can be favorably compared with the 1957 Sorrells House, Shoshone, and the 1961 Villa Rang, Königstein, Germany. The bedroom room, below, is recessed below, affording shade from the western sun. Neutra often used tempered Masonite for portions of exteriors, here painted panels below bedroom windows. Typical is the varying use of full-height and partial-height glass walls, defining primary view and secondary spaces; planes that extend into the landscape, both connecting building to site and affording privacy; a dual indoor-outdoor fireplace located at a pivotal location; the use of tempered Masonite, here painted given the ocean salt, for exterior base panels below some windows, and a virtually intact open plan interior. While his inclusion of a central courtyard, providing a gathering area sheltered from the window, is not typical, he employed a similar courtyard in the Flavin House, Los Angeles, completed the same year as the Connell House, 1958, but lacking such a dramatic site. The architects for the 1992 addition/alteration on the south end of the house, located well away from the primary elevations, should be commended for one of the most thoughtful and compatible additions to a work by master architect I’ve ever seen. This later work exploits the footprint of a rear, little-seen service yard. The large south-facing picture window of the addition is framed by the surrounding wall, distinguishing it from Neutra’s fenestration strategies; the fascia is deeper; the roof extended less than those of other elevations; and the addition’s stucco finish is rendered in a slightly darker tone than the extant original shade elsewhere. All are moves that clearly delineate the new from the old while being compatible with the original character of the Neutra design per the Secretary of the Interior Standards for Rehabilitation No. 9. The minor and few reversible window changes, largely replacing jalousies, are quite typical alterations of the houses of many mid-century architects (jalousies were briefly popular but proved drafty and hard to maintain) and have not affected the integrity of the residence, nor has the inclusion of a later light fixture, also reversible, under an extended roof plane. Thus, in my opinion, the Art Connell House would be considered a historical resource under CEQA. I urge your consideration in retaining this superb example of Neutra’s work. As one of the ‘first generation’ Modern architects who influenced Bay Area Modernism, Pebble Beach is fortunate in boasting an accomplished work by master architect Richard Neutra. Lynn, an excellent suggestion and done, see revised post. Although I still can’t understand why any house needs to be larger than 4000 square feet, I just refuse to believe that the clients (and specifically their architect!!!) can’t figure out how to integrate the existing house into a new mass plan, taking into careful consideration the Neutra house. I thought California was concerned about the planet. Does no one calculate their “ecological footprint”? There should be a law passed that no one person should be allowed more than about 800 square feet of heated lodging. Based on that calculation (which is ample considering world-wide housing ratios), they would have at least 15 people in the projected house. Shame on the clients, SHAME on the architect, shame on the urban guidlines commitee and shame on the spineless politicians who refuse to pass laws for reductions in energy consumation. I’m glad I practice in Europe. Good luck, Barbara. Lynn, thanks so much for following up on the post. Presumably site’s footprint above the cliff is irresistible; I have no idea of the proposed massing, but whatever is conceived is besides the point. As you point out, there is the gratuitous size, bringing along with it everything the U.S. values, or doesn’t. Second is whether we understand that when we destroy something like this, we destroy a witness to a carefully calibrated vision of what a human is and how they engage nature. Neutra truly did walk sites at night, dragging his clients through brush (the Rices in D.C., who loved RJN all the more for it) because “architecture wasn’t supposed to be just for the everyday moments in life, but the honeymoon moments as well.” Lynn, a letter coming from France would be great, and if there is anything you can do to raise publicity that would be great, that is what saved the Kronish House, which is a sound example of Neutra … with the Connell House site, Neutra let ecstasy rip. But now the former U.S. embassy building in Karachi is threatened, too, and protecting it and turning it over to the Pakistani architects who want to adaptively reuse it would be a good political move, as well as show some respect for buildings of significance. I’ve also noticed that the flags are back up on the Lloyd Wright house near Neighborhood Church in Palos Verdes. I wonder what’s changed since all the uproar that created the first time around. though we are a young group…our combined knowledge and passion for protecting the legacy of our modern architectural heritage runs deep. again, thank you for your wonderful support and letter to the county. You are very welcome, Karen. Would you kindly keep me updated regarding hearings about the house/project? b: no problem…sometimes, it takes the village to save a single house. hoping our little community can impact the planners regarding their approval for demolition of this home. I drove by this house this past Friday (June 14, 2013) and was glad to see it still standing. It’s a great example of Neutra’s late work. It looks like someone is living in it. Glad to hear it and thank you for the update. Coincidentally, I just gave a Neutra/Schindler tour Friday to some executives from VS International, a furniture manufacturer that is producing a new line of Neutra furniture and I’ve been somewhat involved with the endeavor. Their American headquarters is based in Charlotte. Yes, VS has made a dent in the US market. Our son’s elementary school is stocked with their furniture (non-Neutra though). Thanks for all of your work on Neutra. I’ll be visiting the UCLA archives this week.